Muslim travelers always seem to have the shorter end of the stick when it comes to enjoying food abroad. In the case of Vietnam though, we would like to call the bluff on that. In fact, we would go as far as saying that besides the pork (and some other strange meat) dishes, there will be halal equivalents of almost every popular Vietnamese dish. You just need to know where to find them. In this article, we list down 10 of the most popular halal Vietnamese food. We have not included any addresses because these eateries have yet to be confirmed halal certified. We will update the list once we have. A big (and we mean big) savoury fried pancake made of flour, and stuffed with a generous serving of beansprouts, seafood or chicken. There is also a vegetarian version which doesn't really appeal to us though. Simple as it is, no every restaurant does it well. Why you should try it? Who doesn't like crispy fried food? The famous fresh Vietnamese springrolls with prawns, bean sprouts, vegetables, more vegetables, and even more vegetables wrapped in rice paper. Finally you dip that into a strong sauce and you take a big bite of it. Most people love it. We hate it. Why you should try it? Listed number 30 on World's 50 most delicious foods by CNN Go in 2011. Pho is the unofficial national dish of Vietnam - a bowl of rice vermicelli served in a thick hot broth with slices of either beef or chicken. But the only reason why it gets a mention in this article, is because the list recounts the most popular halal Vietnamese food, and it doesn't seem right to leave it out. Why you should try it? If you don't, it's like going to Thailand and not having Tom Yam. We can't seem to find an authentic taste of this Vietnamese delicacy anywhere else in the world. 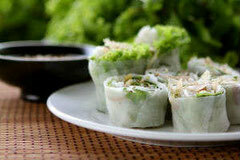 The halal version of this fried spring roll is usually made with seafood, and served as an appetizer. You may also request for Cha Gio to be added to you noodle dishes. Why you should try it? Every bite is flavourful and leaves you craving for more. If you are a fan of clams, this delicious dish of clams boiled in lemongrass is a must-have at every meal. We love how this soup, light tasting at the first sip, then somehow leaves a flavourful and lingering after taste. Great for light meals. Why you should try it? Like most Vietnamese cuisine, the best is brought out of the simplest of ingredients. Little can go wrong with deep fried chicken, but add a serving of fish sauce to it, and this dish is taken to another level altogether. Chicken wings are usually served, but other chicken parts are also becoming very popular. Why you should try it? Most people will love it. Broken rice was a popular staple of the lower class Vietnamese in the past. These days, the status of broken rice with grilled chicken has risen to a position almost equivalent to that of Vietnam’s other globally renowned foods. Why you should try it? It’s filling. It’s hearty. And it’s delicious. Thick chewy noodles made of tapioca and rice flour (somewhat like udon), cooked completely in a thick crab gravy is what you will enjoy with this dish. Rich in flavour, ridiculously fulfilling to the bite is how we would best describe it. Why you should try it? Totally for crab lovers who prefer to slurp than bite their food. While the Vietnamese version of the beef steak does not come with the rare, medium, well done options, these succulent morsels will give most steakhouses in Vietnam a run for their money. Served as cubes alongside French fries, this Vietnamese rendition is one of the early attempts at fusion food. Why you should try it? The beef is juicy and the price is great. Ok, and now for that final special number 10 that is supposed to be the big fanfare, it's... drum rolls... Bun Cha. Bun Cha is Vietnamese rice vermicelli served dry with a sweet sauce, bean sprouts, and grilled meat. While Bun Cha is not halal, but there is a grilled chicken version (which we prefer) called the Bun Ga Nuong that would be served at halal restaurants.) You may have read in recent days that the restaurant in which Barack Obama (together with Anthony Bourdain) ate at when he visited Hanoi, has enshrined the now famous Bun Cha in their shop. So we say, if you wish to eat like a president, eat like Obama. And if you wish to eat like a king, read this. When traveling to Vietnam, we recommend that you stay off the trodden path, and try some of the famously delicious Halal Vietnamese cuisine. Who knows, food may just be the reason why more Muslims would want to explore this beautiful country.